Once upon a time, a book store sold books and a toy store sold toys. That is not the way things work now, though. And Barnes & Noble is a prime example of companies selling items outside of their traditional products in an attempt to lift their bottom-line – and it’s working. Bloomberg reports that in recent years Barnes & Noble has increasingly taken on the role of toy store in the face of rather slow book sales. 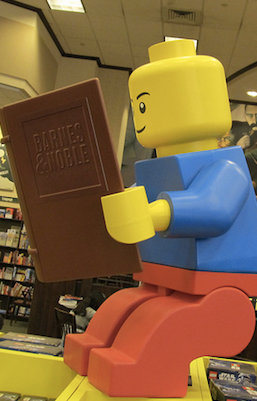 In fact, Barnes & Noble’s toy sales rose almost 20% in the last quarter alone. Officials with the company said on a sales call this week that promoting the store as a place to purchase games, dolls and LEGOs has helped draw more customers to its locations. The company has capitalized on the dwindling presence of actual toy stores; Toys “R” Us has scaled back stores, while other stores like KB Toys have shut their doors altogether. The foray into toy store territory is part of CEO Michael Huseby’s plan to squeeze more revenue from gifts and cafe purchases at the retailer, Bloomberg reports. Officials with the company say consumers are beginning to realize that Barnes & Noble offers items that can’t be found elsewhere – even traditional toy stores. Additionally, Barnes & Noble claims to provide an environment in which families can spend time together. Matt Klipper, head of the Barnes & Noble’s retail group, says families can play together inside the store creating a type of hangout that other retailers can’t replicate.